The Sankofa Experience at North Park University combines readings, films, classes and community meetings concerning social constructions of race and how they impact other identities. Individuals from various backgrounds come together to explore the theological, political, and cultural dimensions of racial reconciliation and human wholeness. The experience culminates in a 60-hour bus pilgrimage (modeled after the historic freedom rides) across the United States where participants grapple with what it means to become a beloved community. Undergraduate students have the option of participating in the Sankofa Experience as a two-credit class (AS-2540) during the Spring semester pending successful completion of an application and interview process. The program is facilitated as a joint venture of the Office of Diversity and University Ministries. Read more about the Sankofa Experience in a recent issue of the North Parker. The Sankofa program is financially supported by a generous grant from the Lilly Endowment. University Ministries, in partnership with North Park Theological Seminary, is able to offer this program to students at a substantial discount thanks to this funding. Sankofa is one of the most powerful and thought provoking experiences students have at North Park University. 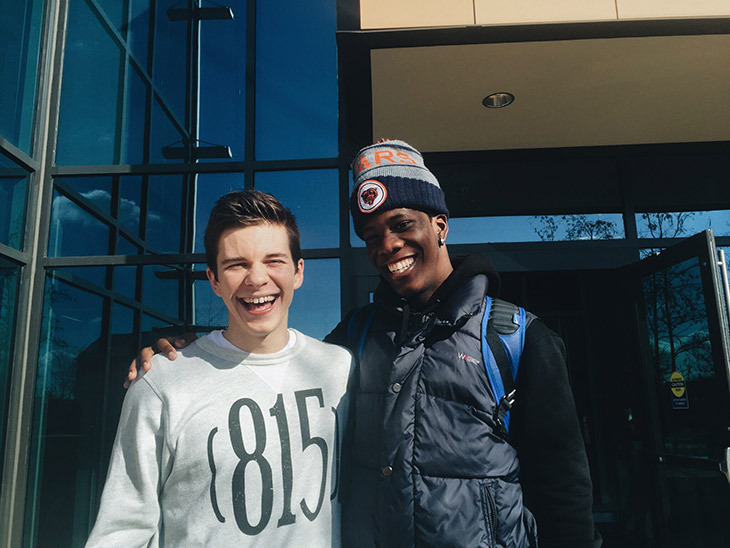 In February 2016, a group of brave, willing students took the journey together in hopes of finding where they stand in the pursuit of racial reconciliation. 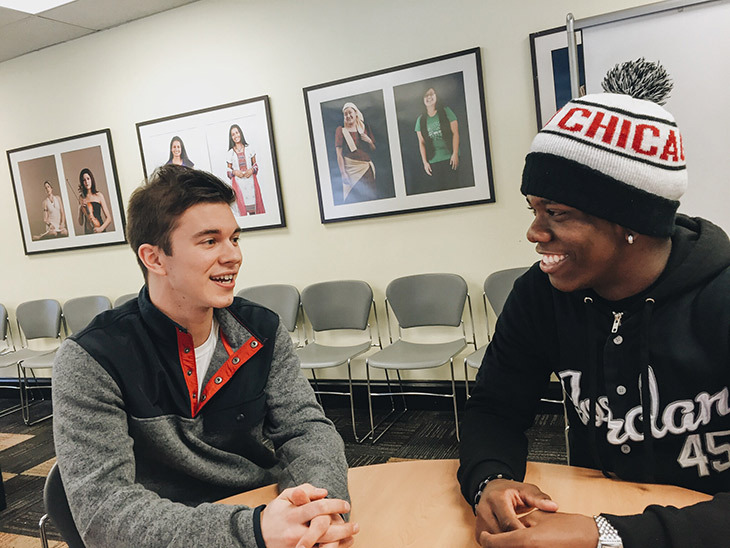 Tyler Nylen, seminary student, and Devin Childress, undergraduate student, were Sankofa partners and dialogued before and after as one way to understand their expectations, shared experiences, and goals for what comes next. What are your expectations for the Sankofa Trip this year? Devin: I really expect to get everything this trip has to offer. This trip is about racial reconciliation and I guess I really expect to go into that a lot deeper. Tyler: You went on it last year right? Would you say that there is something from last year’s trip that would help you this time around? Devin: One thing that is helpful but is also tough is the amount of debriefing you have to do. The places you go to, the movies you watch, and the songs you listen must be discussed extensively. Doing that opens up the dialogue. You’re definitely going to be uncomfortable on this trip but as you continue to be open to different perspectives you’ll become more accustomed to being uncomfortable. Tyler: That’s an awesome way of putting it. The idea that on this trip being uncomfortable becomes what is normal. This will be my first one so I am expecting to learn about other people’s perspectives and what they go through in life. But I’m also expecting to learn a lot more about myself and learning the different ways whiteness contributes to my journey in life. Devin: I think another thing that helps is taking someone’s frustration or story as just their story and not as them bashing you. They are just sharing their experience with you. Tyler: Yeah. I totally agree. Although you both know that changing the entire country is a huge task, what do you feel like you’re able to change here at North Park with a trip like this? Devin: I don’t know at this moment. A change has to start somewhere. For us, we’re at North Park and it starts here. I’m not really sure what I need to minister to on this campus but I know going on this trip will help. What I know I can’t do is think that I can come and be the savior of this campus. I do know that it is a great idea for multiple people to go on this trip because it creates a bond between people who want to be world changers. Tyler: For me, I doubt that by the end of the trip I’ll have everything figured out. What I really think would be helpful is that I come back with a lot more specific questions for me to wrestle through with everyone around me. This will stir up a deep sense of awareness that I think needs to happen where I am at the seminary. Devin is an undergrad who wants to be a pastor and I am in seminary wanting to be a pastor. We have that in common. At the same time, we both have a unique context in which we can view the trip and the different stories we encounter as we prepare for life after the trip. What was the most powerful experience on the trip for you? For me, it was the fact that I was able to release so much that I had been dealing with from back home and hear the voice of God. I had a tough first night on the trip and I was very angry at God. I felt this way because of our talks and debriefs and my bottled up anger that I had no idea was hurting me so much. It still turns my stomach to this day thinking about how God opened my eyes to the importance of speaking up and building people up in just two days. How do you view campus life now that you’re back? I look at campus now as an opportunity to educate. I feel this trip is a trip the entire campus needs to go on–but how likely is that? So now that I have been on it for two years in a row, I am able to give a mini summary to those who I encounter. Many people are blinded and uneducated about the history, terms, and such things that go into racial reconciliation. I learned that from my partner Tyler, who growing up, did not learn about certain things that were covered on the trip that I, as a black male, knew about. Is that his fault? No. Is it my responsibility to educate people who may be in the same boat as he was? It is now. I learned about my potential. I am someone who is a natural born leader. I lead by example but I am also a very vocal leader. Those are both gifts from God and now I understand how to use them for his Glory. The skills and the education that I have makes me a dangerous weapon in God’s army that is fighting this war of racial reconciliation. The most powerful experience for me was actually our group conversations on the bus and debriefs. It was in these moments that we were able to truly engage with each other and hear the honest questions and convictions of each individual on the trip. There would be times someone would get up and say something that would blow your mind, or convict you, or challenge you in a way that was stretching, and gave you a whole new perspective. It was also cool to see the progress people made as the trip went on. They became more comfortable to speak and their eyes were opened. One main thing that challenged me is my own family history; I want to explore that more. I was challenged to explore my own story, history, and background in a way that desires to learn more about how my family got to be in the specific status and place we currently are now. What I learned is that is happened through systemically advancing on the backs of others, even as this may extend back centuries. As a white male, I feel that I’ve never really engaged this history or asked questions about it, because I’ve never had to. Therefore, I would like to engage with my own personal history, so that I can consider how I might move forward. I learned on this trip the importance of engaging with where I come from.